IntroOffers aren't on online account? Applied easily and was preapproved (good credit and 100% payment history), but went to the online account and it doesn't show that I have any of the introductory offers.... has this happened to anyone else?! I don't want this card if I have to pay that $95 fee first year.... Maybe I just have to wait to activte my card? your card is not even activated and you give this negitive review? I already have 3 Capital One cards; Platinum (hate), Quicksilver (first card years ago to rebuild credit.. meh) and Venture (love!). My son is graduating high school in May of 2019 and we are going on a family trip to Walt Disney World.. NOT a cheap adventure. 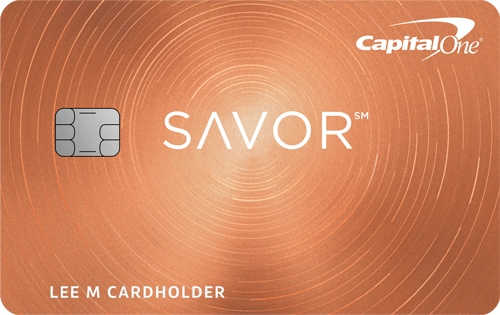 When I saw that the Savor card offered a $500 bonus after spending $3k in 90 days AND 4% cash back on dining & entertainment, I knew that was the card I wanted. After doing a LOT of research, I figured I had a 50/50 shot at approval. I didn't have an offer or invitation. All my other Cap1 cards have a zero balance and I used them all at different times throughout the time I had them. Long story short, recent usage (approx $1k a month across all three current Cap1 cards), no balance and long time cardholder. I applied online and was not instantly approved. I got the "we will need more information and you'll receive something from us in the mail in 7-10 business days." I decided to call the application status line approx. 3 days later. The recording said my application was in process and to expect something in the mail...blah..blah. I held on for a representative who said the same thing.. "in process" but then sent me to their fraud check line. This person asked me several questions to verify my identity and said thank you, and.. you guessed it... I will receive something in the mail in 5-10 business days. Well, I'm literally waiting to pay for this trip based on getting approved or not on this card.. so I called again. 5 days (not business days) after my last call. Recording STILL said it was being reviewed. I held for a representative to find out that I was APPROVED the same day I called to give them additional information. Since I recently paid off all my balances on all my cards, my credit score went from the 630's to high 600's during the time my credit was checked for this card. Take aways.. this is the SECOND card.. ironically BOTH from Capital One where I wasn't approved instantly online, but later approved for pretty decent credit lines ($10k & $8k). Don't get discouraged if you see that message when applying online. You DO NOT need a score in the 700's to even consider this card.. AND... CK recommendations are not always correct. Good luck! I love Capital One so I'm thrilled! The customer service is horrible. They will not appreciate your business. Spent the day verifying the card so we could use it with no problems only to have it decline when we tried to make our second purchase. Now we are IN LINE to make our purchase when it declined. We call and are placed on hold for 15 minutes WHILE STILL WAITING TO PAY only to have them say we needed to now send a copy of our DL to verify we are who we are. At this point it’s 5:20PM and the store closed at 5. We had to leave without picking up our truck and drive back across town all while still on hold. It took over an hour to get verified for the THIRD time today but at this point we can’t get back the embarrassment or time wasted. Find a better card than Capital One. My Capital One cards have worked every time since 2003. I use this almost every day. I think you should have had a backup card. I've had merchants have trouble running a card before and I'd use a backup with no problem. Rsmy123 not everyone has a backup card or would want one. It's ridiculous to have only one card AND depend on that card for anything important. Don't blame your lack of preparation on others. If you have/depend on a single card then you're either stubborn or stupid or probably both, and deserve the embarrassment. Were you buying a truck with a credit card? If give your going to give a review and say the card is horrible can you at least give a explanation as to why you think so.